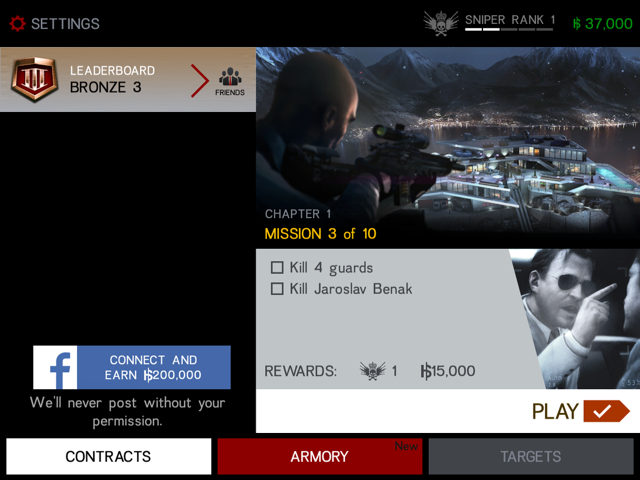 At the beginning of each mission you’re presented with a set of objectives that always include shooting the bad guy. The objectives might include things like “kill three guards without sounding the safe-house alarm” or “trigger a car alarm to entice a guard into the killing zone.” Sometimes these pre-main-target objectives seem contrived. It would be better to construct the game play so the main target didn’t appear until, for example, you had killed the three guards in the living room. Still, once you’ve started the mission you become immersed in completing each objective without raising an alarm. Once you’ve been given the mission objectives and tap “continue,” you appear on a perch somewhere outside the killing field, which is usually a house. 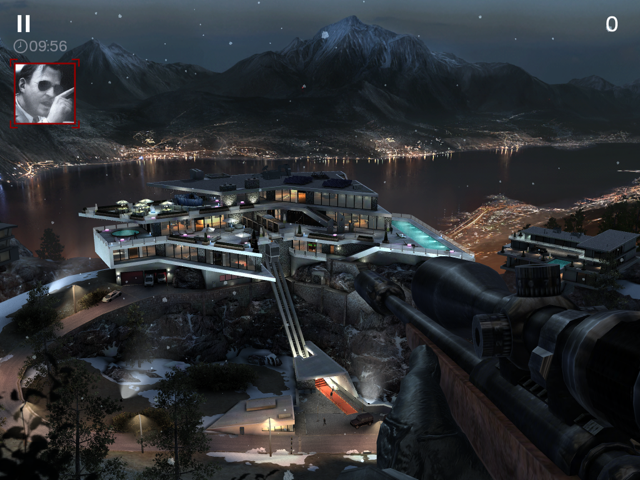 You aim your rifle in the general direction you want and then tap once to sight through the scope. Once you’re viewing through the scope you can pinch to zoom in and out, as you might with a real scope. You will want to stay zoomed out to get the lay of the land or to search for specific targets, then zoom way in to get a good shot. In the early levels most of your targets will obligingly stop moving eventually so you can shoot them with little difficulty. In later levels targets continue walking indefinitely, so you have to lead them accordingly to make a hit. In this respect the gameplay seems fairly accurate: the amount you need to lead a moving target varies depending on distance and their speed. There is a button you press to hold your breath so your rifle doesn’t sway with your breathing. Of course you can only hold your breath for so long before you gulp air and the sights once again begin to sway back and forth lazily. At the end of each successful mission you get your payoff in cash. 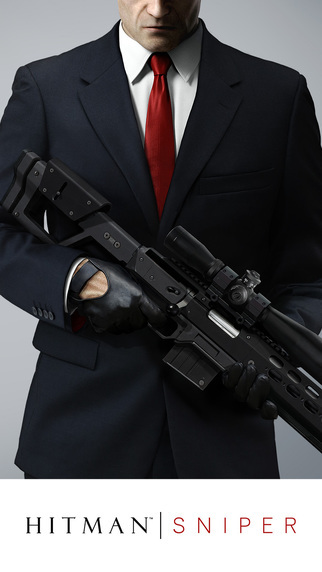 You use the cash to upgrade your rifle, which will be necessary as the missions get harder and harder. There are 150 missions and 13 rifles; each rifle has several modifications that can be made including upgraded stocks, barrels, sights, and grips. I’m using version 1.0 of the game on an original iPad Air. In several hours of game play, the game crashed once, and encountered some jerkiness in the video about once an hour. I’m hoping this can be fixed with an update. The app store game description warns against using the game on iPad versions 1 and 2, but claims it works well on all iPads after that. Hence my hopes for update fixes. 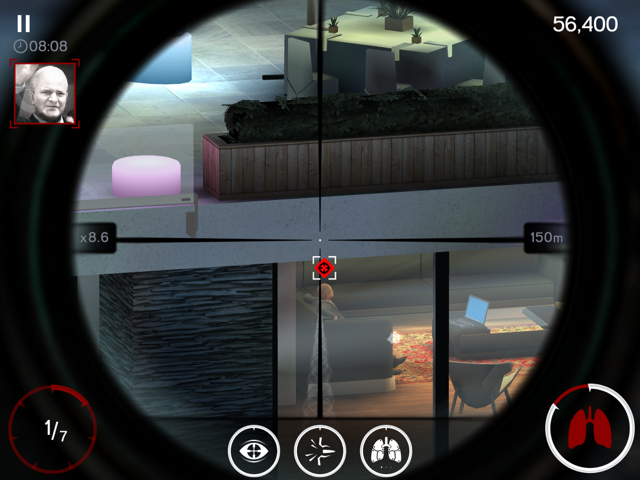 Here’s a link to Hitman Sniper in the app store. It’s $4.99 and well worth it. Also, if you have new infos and tips, share! I couldn’t find more and I’m sure there are some more good stuff to do.